Note: this guideline is issued by the Surveyor-General under section 7(1)(ga) of the Cadastral Survey Act 2002 about the Rules for Cadastral Survey 2010 and is not legally binding. The following information relates to rule 17 and alternative requirements for defining boundaries of a new non-primary parcel where they are not able to be determined accurately in terms of any of the underlying parcel boundaries. 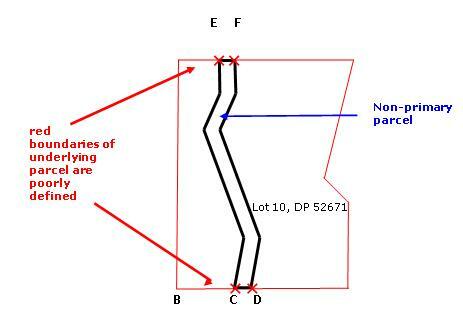 Where a new non-primary parcel's boundaries are unable to be determined accurately in terms of the underlying parcel boundaries, the survey must be in terms of rule 17 (Alternative requirements for non-primary parcels). It is anticipated that rule 17 will only be applied in the rare cases where the underlying parcel boundaries are of poor accuracy. For a covenant only survey where the relationship between the covenant parcel and the underlying parcel has not been or cannot be determined accurately, rule 16 (Alternative requirements for covenant parcels) or rule 17 (Alternative requirements for non-primary parcels) may be applied. Note: Under r 17, witness marks as well as PRMs are required but under r 16 only PRMs are required. Rule 17 contains specific requirements that supplement rules 1-15 and provides alternative requirements to those set out in rules 1-15. 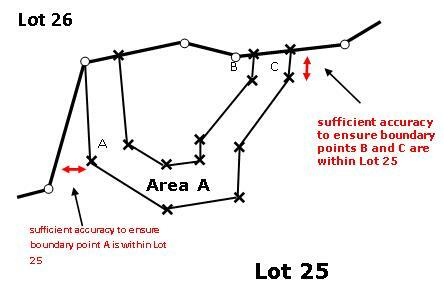 Rule 17.1(d)(iii) (requiring the connection to a cadastral survey network mark irrespective of the distance to it) varies rule 4.2 which has a distance criteria. Rule 17 does not include requirements for non-primary parcel appellations as these are contained in rule 5.5.
the accuracy of the relationship between the non-primary parcel boundaries and the underlying parcel boundaries cannot be determined accurately. It is expected that rule 17 will not be applied very often. Examples of when it may be applied include a RoW or an electricity easement that passes over multiple parcels whose boundaries are poorly defined. will not apply if the relationship between the non-primary parcel boundaries and at least one of the underlying boundary points is accurately defined (for example, if the relationship with point A was sufficiently accurate). Rule 17 applies where the accuracy of all of the intersections of a non-primary parcel with its underlying parcel boundaries cannot be accurately determined [r 17.1(a)(ii)]. 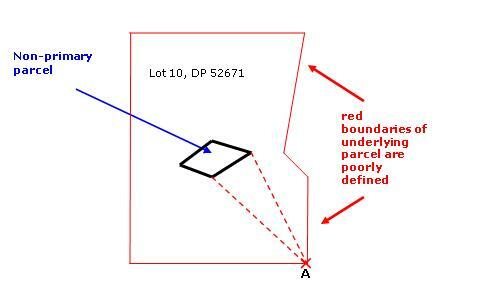 An example of this is illustrated in Figure 2 below where all of the boundaries of the underlying parcel are poorly defined and the intersections of boundary points C to F with the underlying parcel boundaries cannot be accurately determined. The rule will not apply if the relationship between the non-primary parcel boundaries and at least one of the underlying boundaries is accurately defined. For instance if, in the following example, the southern boundary was accurately defined, boundary points C and D could be defined accurately in relation to point B. In this case, for a rural survey, points B, C, and D would be class B. Points E and F could be class D if the underlying parcel boundary meets the criteria for an accepted boundary in rule 6.3 [r 3.2.4(b)]. The survey and CSD requirements of rule 17 would not apply. Where a non-primary parcel has not been accurately determined relative to its underlying parcel boundaries, the relationship between its boundaries and its underlying parcel boundaries must be sufficiently accurate to ensure that its boundary points are either within, or coinciding with, the underlying parcel boundaries [r 17.1(c)]. 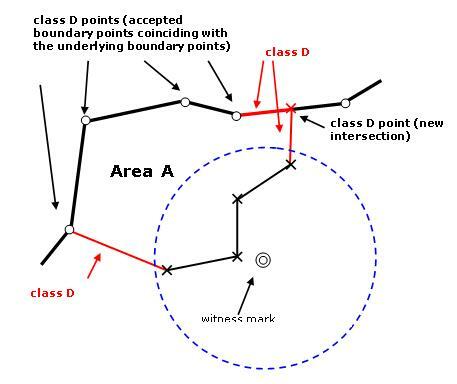 As illustrated in Figure 3 below, non-primary boundary points A, B, and C must be within, or coinciding with, the boundaries of Lot 25. They are not permitted to overlap into Lot 26. Rule 17 does not apply to unit and lease areas [r 17.1(b)]. In these cases, the new non-primary parcels must be located accurately in terms of the underlying parcel boundaries. rule 7.4.2(a) (number of PRMs and distance between PRMs and a boundary point). on the Diagram of Parcels, the annotation 'not defined by survey' must be shown for the related boundaries [r 17.2(c)].